If you live or work in an area where storms occur frequently, it’s more than likely that you heavily depend on your neighborhood’s storm drain. Storm drains not only provide safer driving conditions, but they also prevent your yard and driveway from filling up with water. If there was no place for the excess water to flow, it could flow into your home or business office. That’s why storm sewer cleaning is so important, and why you can rely on us to clean it properly and efficiently. 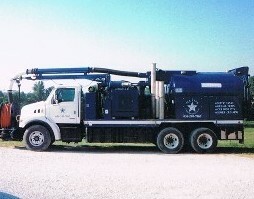 We are always available to help with any storm sewer cleaning or draining issue you have. After a storm, flooding is normal in some areas, as the amount of water overwhelms the sewer system. But if the flooded water does not naturally drain away with time, you may need to call a professional service to clean the storm sewer. Our storm sewer pumping and parking lot drain pumping services use high-pressure streams of water to blast away any obstructions in the sewer line. If the obstruction is not easily moved or requires further investigation, we can use our sewer line camera to determine the best course of action. This service uses a small camera, which is sent down the pipe to give us a better look at what is causing the blockage. In order to accommodate all pipes, we have two cameras that come in different sizes, so one is guaranteed to fit, even in smaller, older sewer lines. Common causes of sewer drain blockages are buildups of debris, mineral deposits, dirt, and tree roots. These materials can clog the pipes underground and cause severe damage to your underground water system if not treated carefully. Of course, the type of treatment depends on the severity of the damage. Our technicians inspect your property in order to determine how to treat the problem. The best way to avoid any problems is to perform routine cleaning and maintenance. Routine cleaning reduces the amount of trash, debris, and pollutants in the storm drain. Constantly checking your storm drain not only lets you know when you storm drain needs to be serviced, but it also helps protect you financially. Extensive damage to a sewer drain is costly, and preventative maintenance is one way you can help yourself save money. A clogged parking lot drain can render your lot totally useless. After heavy rain or snow, the drain can become clogged with fallen leaves, tree branches, or any other kind of debris. This causes the drain to back up and fill the parking lot with water. Not only does this standing water discourage your customers from coming into your business, it also presents a potential hazard. The liability rests with you for any damages sustained to customers or vehicles while on your property. That's why it is important to get parking lot drain cleaning as soon as possible. We know how important it is to have a parking lot where customers can easily park, and walk to your place of business. A flooded parking lot not only makes driving conditions more difficult, but it’s also dangerous. Our parking lot drain cleaning services are available 24 hours a day, 7 days a week. Our team of sewer cleaning experts arrives to your location promptly. Once we get to your location, we immediately survey the situation, and decide which course of action to take. Rely on our team of experts to get the job done quickly. Parking lots, driveways, and yards can quickly become flooded if they’re not handled properly and in a timely manner. Our storm draining cleaning technicians have received the proper training and have the experience to see that your area is drained correctly. Floods and drain backups can cause extensive damage to your property and we don’t want that to happen. We take the necessary time to inspect your property to ensure no excess water has been left. All of our techniques have been tried and tested, so you can depend on us to handle any storm draining issues you have. Contact us to inquire about our storm draining services. We proudly serve customers in St. Charles, Wentzville, St. Peters, and St. Louis, Missouri, as well as the surrounding areas. All Star Pumping and Sewer Inc.